“Abe Lincoln Ghost Fence” – Napo B "Live"
This is the ghost fence painting. This started with a dense green foliage contained by a chain link fence. 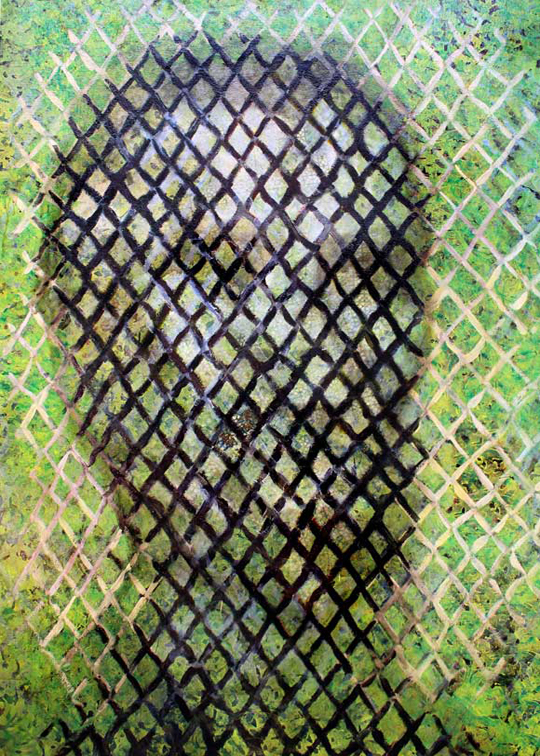 When I painted over the chain link in white the shadow of the face emerged. At first people where telling me that they had the impression of a face looking at them through the fence. After the third person told me they could see Abraham Lincoln embedded in the fence, I began calling it “The Lincoln School Ghost Fence”, that had captured the ghost of Abe Lincoln. For more information about this painting contact the Angell Gallery.